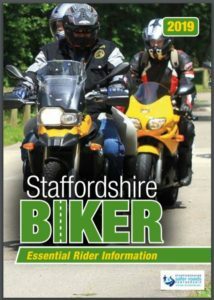 This handy pocket sized guide, you can carry in your riding jacket will give you information on the local roads “ride it right routes“, Biker Jack, the Bikers breakfasts, Bikesense, detailing the team behind Staffs Biker & some handy hints for general rider development. Think of it as your companion in your pocket if you are biking in Staffordshire. If you would like some to distribute at your place of business or among your club members you can get some by contacting bikers@staffordshire.gov.uk, or by phoning 0300 111 8012, failing that ask us at any of the bikers breakfast events if you would like to have a few to hand over to your people in your bikers club, workplace, training centre, special event or school & we’ll happily provide a few more copies.